My dog is afraid of the vacuum cleaner. What do I do? 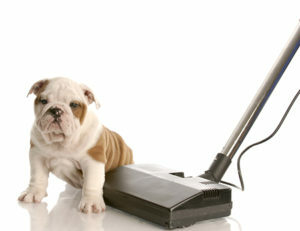 Dogs occasionally develop fears of certain objects – such as the vacuum cleaner. Some are afraid of brooms, the Christmas tree, or a stuffed toy. In most cases, these fears stem from the item being unfamiliar. It is important to remember fear isn’t rational – being afraid of the vacuum cleaner may seem silly to a human, but some of our fears would surely seem silly to a dog. A mild fear can be turned into a more positive experience by giving treats every time the dog approaches the object. Ignore the dog and toss some treats over with every step they take – this will help your furry friend associate the object with something positive. You can also leave a trail of treats that leads up to the object. Let the dog get them at their own pace and try to ignore them investigating. Our reactions often reinforce fears instead of alleviating them. More severe fears will take more time and patience. You can for instance leave the vacuum cleaner sitting in the middle of the room, surrounded by treats. Once the dog is able to walk around the vacuum without showing fear, turn it on for a few seconds and toss some excellent treats to the dog. Gradually increase the amount of time the vacuum is on. Once your dog is comfortable with the vacuum cleaner sitting still, turned on, you can begin moving it. Start with moving it turned off and give your dog some treats. Once the dog is okay with that, try moving the vacuum around when it’s turned on.